A little more than three years ago, the ancient city of Mosul – Iraq’s second-largest -- was a strategically important northern metropolis on the Tigris, home to a diverse population of almost 2 million Arabs, Assyrians, Turkmen, Kurds, Yazidis and others. In June 2014, a relatively small band of radical Islamic insurgents defeated a significantly larger force of U.S.-trained Iraqi soldiers and police officers, many of whom turned and fled, stripping off their uniforms on the run, according to The Washington Post. Earlier that year, the Islamic State had captured the city of Fallujah, but because of Mosul’s position at the nexus of trade routes to Syria and Turkey, its lightning-fast fall was seen as a major blow to the Iraqi government in Baghdad and a symbol of its weakness. ISIS also managed to capture enormous caches of arms, munitions and vehicles largely supplied to the Iraqis by the U.S.
What followed was a reign of destruction and terror said to include summary executions and even crucifixions of real and perceived opponents of the so-called caliphate the Islamic State was putting into place. Just days ago, after bloody and grueling house-to-house combat, Iraqi and U.S, coalition forces declared victory in routing ISIS, but the devastation left behind is enormous. A Time magazine report in which photo-journalists recalled their experiences in Mosul said that a satellite assessment of the Old City showed 5,536 buildings damaged or destroyed. Click here to see more photos of the destruction in Mosul. 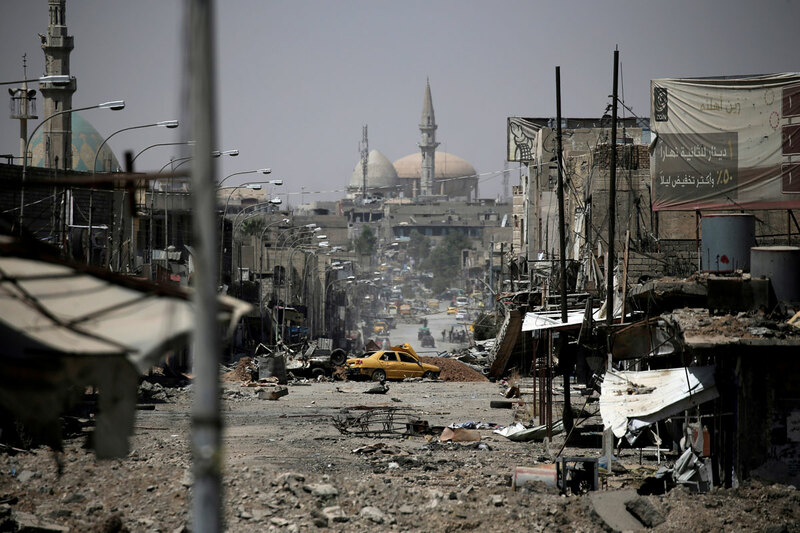 To get a sense of the scale of rebuilding needed to bring Mosul back life, The Fiscal Times asked Lise Grande, the Baghdad-based Deputy Special Representative of the United Nations Assistance Mission for Iraq, for an assessment via email. Ms. Grande has previously been involved in coordinating UN humanitarian responses in South Sudan and Republic of the Congo, among other postings. How soon can the rebuilding of Mosul begin? Do mines and booby traps have to be cleared before work could get started? Before any project begins, experts [from the UN Mine Action Service] check to ensure the area is free of explosive hazards. Immediate stabilization starts as soon as a district is declared safe by the Iraqi government, followed by expanded stabilization and then reconstruction. Eastern Mosul is already recovering. Things are not perfect, but there is tangible, very visible progress. Schools and businesses are open, and nearly the entire population has returned to their neighborhoods. The United National Development Programme’s Funding Facility for Stabilization, which focuses on immediate and expanded stabilization, has been active for months in eastern Mosul, and 230 projects are under way. Local contractors are repairing the electricity, water and sewage grids and thousands of people are being employed on public schemes, upgrading infrastructure and restoring public facilities. The situation in Western Mosul is incomparable. Preliminary damage and loss assessments are under way. Of the 54 residential neighborhoods in western Mosul, 15 are heavily damaged, 23 are moderately damaged, and 16 are lightly damaged. UNDP is already active in the lightly damaged districts: 70 projects have started, and hundreds more are being planned. A Reuters story quoted you as saying that basic repairs will cost more than $1 billion and probably much more than that for long-term reconstruction. What would a reasonable estimate be for Mosul to be a rebuilt and functioning city again? Based on the first damage and loss assessments, we estimate that $470 million is needed to help restore the main electricity, water and sewage grids and rehabilitate key public facilities including hospitals, schools and houses in the most heavily damaged neighborhoods in western Mosul. A minimum of $237 million is required in the moderately and lightly destroyed districts. This is double the amount we originally estimated for western Mosul and is in addition to approximately $370 million required for the stabilization of eastern Mosul. Where will that money come from? Have U.S. and coalition members made any financial commitment to rebuild? How much will the Iraqi government contribute? Twenty-three donors have contributed more than $420 million to UNDP’s Funding Facility for Stabilization since 2015. A significant portion of these funds is being spent on stabilization in Mosul. More than 1,100 stabilization projects are completed or being implemented across 23 locations. Major efforts are being made by the [Iraqi] Government to accelerate stabilization and reconstruction. With almost a million Mosul residents displaced from a city that once had almost 2 million citizens, how much has the UN already spent to care for those who fled? And what do you expect it will cost to support those who are in camps and those who remained in the city until some degree of stabilization can be achieved? In July 2016, humanitarian partners [NGOs] requested $284 million to prepare for Mosul; 100 percent of this appeal was funded. Monies were used to construct emergency sites and pre-position life-saving supplies before military operations began. The 2017 Humanitarian Response Plan for Iraq, which was issued in early January, requested $985 million for the year and included the estimated costs of supporting civilians impacted in Mosul. By early July, only 43 percent of the 2017 appeal, $440 million, had been received. Partners have done their very best with the funding they have received; more than 1.8 million people living in and near Mosul have received assistance, including the 940,000 who have fled their homes. To continue supporting the people from Mosul who need help, as well as more than 2 million displaced people who rely on humanitarian assistance to survive, partners are urgently seeking $545 million. In early July, partners calculated the costs of supporting the people who have fled Mosul using three scenarios. If families are unable to return to their homes for three months, the costs of the Mosul humanitarian operation will be $182 million. If families are unable to return home for six months, the cost of the operation will be $312 million; if families stay outside their homes for nine months, $448 million will be required. In terms of loss of life and physical devastation, how does Mosul compare with other scenes of destruction that you have seen? In terms of destruction in Mosul, we are really talking about two cities. Eastern Mosul is recovering. There are difficulties and problems, but the trend is positive. Western Mosul is in a different category. It's going to take a lot longer for things to return to normal--a lot longer. The levels of destruction we are seeing are the worst in Iraq. Western Mosul represents one of the largest and most complex stabilization challenges the UN has ever faced.